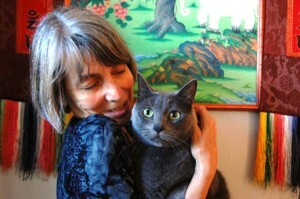 Lama Zopa Rinpoche gives Amy Cayton advice on cat care. Photo courtesy of Amy Cayton. In 2007, I had a huge karmic upheaval, mostly manifesting in my body. Among other things where karma had run out for me, I was no longer so able to travel through the FPMT world giving trainings as my form of service to Lama Zopa Rinpoche. “Uh-oh,” I thought. I interpreted my situation to mean that following purification, I needed to create merit. How would I do this since many of my former avenues of merit-making were no longer open to me? Perhaps, as life was pointing to a less active way of “showing up,” I could spend more time meditating. The only problem was that mental focus was one of the many things that had suddenly shifted and become elusive. Amy Cayton with two cats at their first foster mother’s place. Photo by Amrita Cayton. When I eventually saw Rinpoche, I suggested maybe it was OK for me now to see a few people in my role as therapist and then try to help some sentient being of the cat variety. Rinpoche gave me some advice about practices for really helping the kitties, and since then, cat cuddling according to Rinpoche’s instructions has been a huge part of my practice. For example, I have to practice avoiding attachment; in other words, these aren’t “my” cats. I have to practice equanimity, which means that every cat deserves exposure to holy objects, mantras, blessed water, compassion, patience, life, and catnip – not just the charming kitties. I must meditate to keep myself sharp to be most helpful. 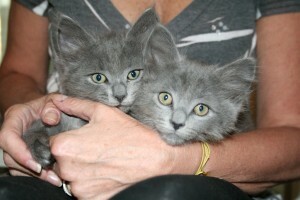 I must remember emptiness and that only a blink ago these cats were human beings and should be treated as such. I see karma visibly in play as cats that appear darling to me are not adopted while cats I see as challenging fly out the door to new homes. Amy Cayton with a rescued cat. Photo by Amrita Cayton. There is a significant interdependence between the kindness I receive from the cats and what they receive from me and the way we all come together – cats and volunteers. Volunteers remove the cats marked for immediate death in shelters and put them in safety. Then the cats are rehabilitated from the rough circumstances and karma that brought them to us – a kind of bardo – until their next home is found. Doing this work has been a hugely effective way to see my mind and my projections. I can catch my mind so much more quickly with animals than I do with people, with whom I might believe my story about them for too long. If you need a non-cushion practice, please consider adopting one of our kitties at Purebreds Plus if you are in California, Nevada, or Oregon in the United States. Consider supporting a shelter or animal rescue in your area. I wish you the same satisfaction in your service as I have in mine. Amy has been a student of Lama Zopa Rinpoche’s since 1996. She has completed several retreats with Rinpoche and has offered service in a number of ways, including working as a consultant to the FPMT Education Services Service Seminars, being a house helper to Ribur Rinpoche, serving as FPMT North America Regional Coordinator, and most recently providing cat refuge and rehabilitation. Amy works as a psychotherapist and coach. She endeavors to be a better Buddhist and a better human. She lives with and around her Cayton family in the Santa Cruz, California, area.